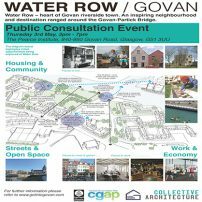 Exciting designs have been published for the lively and attractive waterfront development to be created at Water Row, Govan. The proposals, which were shaped through a series of community consultations during 2018, will deliver stylish riverside flats and townhouses, together with smart commercial space at prime ground floor locations, all set amongst high quality streets and appealing new public spaces, each with a different character to discover and for people to enjoy. The stunning mixed-use development is designed to offer a diverse range of commercial, leisure and community uses that meet local needs and attract new visitors, residents and business to Govan. Ranged around and capitalising on the planned Govan Partick Bridge, the Water Row Masterplan proposals aim to rejuvenate Govan’s waterfront, reconnecting the town centre with the river to create a thriving city destination of unrivalled heritage, character and quality that is distinctly Govan for Govan. The Water Row Masterplan proposals are presented in three documents: Part A – The Masterplan, Part B – its Appendices and Part C – the Stakeholder Consultation Report. All proposals are currently illustrative and are there as a guide to the site’s future development potential until such times as detailed design, permissions and funding are secured for each of the planned future phases. 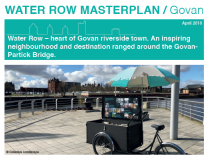 All the latest project details can be found on this web page, including the newsletter distributed in January 2019 to nearly 3000 homes in and around Govan town centre. The masterplan proposals are also on display at Elder Park Library, the Community Hub at 901 Govan Road, the Pearce Institute, Govan Cross Shopping Centre, Orkney Street Enterprise Centre and Riverside Hall. You can send any comments or queries direct at anytime to: [email protected], OSEC, 18 Orkney Street, Govan, G51 2BX or click Get Involved for the latest ways to participate in the development of this important site. 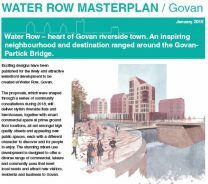 The Masterplan for Water Row is being brought forward in tandem with exciting proposals to redevelop Govan Old and to build a new bridge across the River Clyde at Water Row. As a new gateway to Govan from the West End, the bridge will form an important part of an attractive new route enabling thousands of pedestrians and cyclists to travel easily throughout the waterfront area and beyond. With Govan at the hub of journeys, the increased activity will bring renewed life blood to Govan town centre and will increase demand for new housing, community and commercial space throughout Govan. New development at Govan Old seeks to utilise the national significance of the A-listed building (formerly a church) and its internationally acclaimed collection of medieval monuments, the Govan Stones, to develop the location as an important enterprise and cultural hub on Govan’s waterfront. Seeking to capitalise on its close proximity to the bridge and the 1,300,000 visitors to the Riverside Museum each year, Govan Old will be a vital landmark and destination on Govan’s rejuvenated waterfront. Masterplan: Start – November 17. Complete – September 2018. Publication – January 2019.